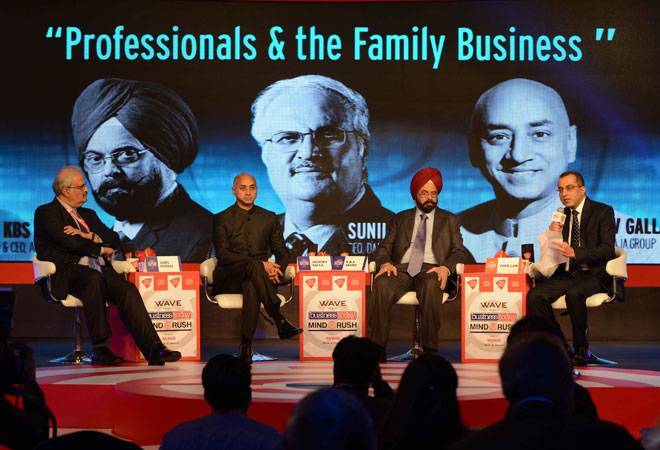 The third edition of Business Today's flagship event Mindrush, opened to an invigorating debate on 'How family businesses ought to be handling professionals.' A highly pertinent discussion, given that India is a young country and most family businesses are currently in the second and third generation stage. However, they would soon be faced with handling the transition to fourth and fifth generation, much of which would involve giving management control to professionals hired from outside. Yes, succession planning and letting go of control is a big challenge for family run businesses. Vivek Law, Editor, Business at TV Today Network, who moderated the session, pointed out that 90 per cent businesses don't survive beyond third generation. "Globally the trend is getting out of businesses once you've created it, allowing professionals to take over. There are successes however on both sides of it. There are no rights and wrongs here," said Law. The three guests on the panel debated the issue with insights from their own journey - K.B.S. Anand, MD &CEO, Asian Paints; Sunil Duggal, CEO, Dabur India and Jayadev Galla, Vice Chairman & Managing Director, Amara Raja Group. The intense debate had the panellists disclosing their strategies on handling relationships between professionals and promoters and what looks like the way forward for them. The panellists concluded that for businesses, professionals need to be made partners in creating wealth for the organisation. They need to think and behave like entrepreneurs. "To make professionals entrepreneurs, there has to be a tolerance for risks," said Duggal of Dabur which has its own experiences in handling succession. Others like Galla of Amara Raja stressed on adopting a collaborative relationship with professionals and giving them enough space to function. Managing succession is crucial for family businesses since there are enough instances of relationships between family members turning acrimonious. There is often no clear roadmap for succession planning. Galla, who is in the process of having two of his nephews joining the business, says he got really serious about joining his father's business only after two years of joining the business. None of Galla's two sons were interested in joining the family business, something he thought was a setback, but he eventually allowed them to decide what they wanted to do in life. Dabur's Duggal chipped in, "The promoter should manage the business as long as he can because he has a much bigger stake in the business. But when the entity becomes too large to manage its time to plan the succession." The panellists delved on different methods in place to handle the sensitive issue. Anand of Asian Paints said, "We have a method in place for evaluating key positions that need succession planning and proposing to the board on a regular basis, who can fit the bill." Duggal of Dabur said the company handled the issue around 15 years ago with experienced consultants. The strategy is to have a governing council in place which sets the mandate on what to do and what not to do. The perception is that professionals who have been with the company for a long time find it easier to have promoters reporting to them. K.B.S. Anand, MD & CEO, Asian Paints has a different perspective. "Long years in a company help because you are understood to be person with proven performance but that certainly is not the only thing. There are many more intricacies to handle," he says.